We are a fully insured, full service company. If you have purchased a piece of machinery, we can go to its origin, safely load it onto our truck, transport it to its new origin, unload it, set it in place, and assemble any components. Moving equipment is what Georgia Rigging does. No matter what the difficulty of installation may be, no matter how big or small the piece or pieces of equipment may be; rest assured your equipment is being handled with care. Do you have a machine that you recently purchased and need to it transported to its new location? Georgia Rigging can handle your complete machinery moving needs from coast to coast with our in house fleet of truck and trailer options. Georgia Rigging, Inc. is located conveniently just south of Hartsfield – Jackson Atlanta International Airport on Interstate 85 in Southern Fulton County. The key is that we value our customers, their equipment, and the time constraints that come with each move that is performed. 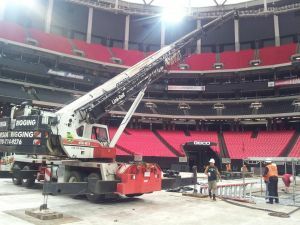 Whether it’s a single piece of equipment or a complete plant relocation, Georgia Rigging has the equipment and skilled labor to perform the most challenging equipment moves to help our customers continue running their business with minimal down time. Along with our rigging and machinery moving division we also provide our own in house crane service up to 70 tons, four road tractors and trailers, and 8,000 square foot of indoor storage and several acres of outdoor storage. Our Mission: Meet and exceed our customers’ expectations, build long-lasting personal and professional relationships while producing the ultimate in rigging and lifting satisfaction with every customer. Allow the Georgia Rigging, Inc. team to put our 90+ years of knowledge and craftsmanship to work in your next move! © Copyright 2019 Georgia Rigging All Rights Reserved.